Breed: Certain breeds are know for certain skin problems. Age: Skin conditions in younger dogs may indicate a genetic (inherited) problem. Young dogs are more susceptible to fleas, mange, bacteria (impetigo) and fungal dog skin infections. Older dogs are more susceptible to cancerous conditions (neoplasia). Time: How long has a dog been suffering from the condition and how did it change over time. Skin conditions that happen quickly could be mange (scabies) or a skin allergy due to food. Itch: Itchy dog skin itself doesn't indicate a specific skin condition, however, if the skin is itchy and there are no lesions, the problem could be allergy, mange or infection. Diet: It is possible for dogs to have a reaction to foods that they have eaten for years, but then suddenly develop an allergic response. Time of Year: Problems that only occur seasonally could be a reaction to environmental factors such as pollen. Human Skin Conditions: Problems such as mange and scabies can spread from dogs to humans and back the other way. Location on the Body: Canine skin conditions on different areas of the body point to specific problems. 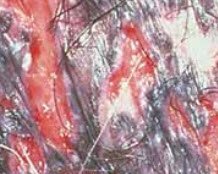 Head and Face Mange (scabies), Allergic reaction (atopy to food, insect or something in the environment)), Infection (dermatophytosis), DLE (discoid lupus which appears as coin shaped red bumps under the skin), immune system skin reaction (pemphigus foliaceus). In dogs under 2 years of age, papules or dog warts can be found in and around the mouth. Near Reproductive Organs Canine warts start as papules (round raised areas), and can then develop into cauliflower shaped warts. They are caused by the papilloma virus and do not require treatment if not causing your dog any discomfort or bleeding. Dog skin disorders that involve canine warts are also found around the eyes and inside the mouth and nose, in dogs under 2 years of age. Dogs older than 2 years of age are usually immune to dog mouth warts. The shape and how wide spread the dog skin disorders are inform the diagnosis process. The following chart details various types of appearances and the possible causes. Contained or localized in one area Dog skin Infections (bacteria or fungal cause such as a yeast infection in a dog or dog staph infection (often seen on dog abdomen). Hair or Skin Color Change Hormonal disease, abnormal tissue growth (follicular dysplasia). Conditions such as dog black skin disease. Lump under Dog Skin Tumor (benign, due to injury or trauma, vascular, smooth tissue). Could also be a dog skin wart or papilloma. Cyst on Dog Benign skin growths that appear on the surface of the skin. Most dog skin cysts are benign. A biopsy is sometimes needed to confirm that the cyst is not malignant (cancerous). Papules: A dog skin papule is a small solid inflamed area that does not contain pus. It indicates bacterial infection, mosquito bite reaction, scabies, allergy or an auto-immune skin condition. 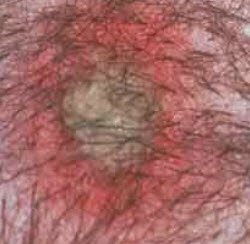 Pustule: this is a small inflamed are that is filled with puss such as a pimple. This type of dog skin disorder could indicate an infection (bacterial or fungal) or auto-immune problem (when the body responds to a substance that it shouldn't respond to). Vesicle: a vesicle is a small fluid filled sac. It can be in the skin or beneath the skin. 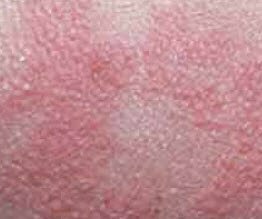 This condition can be caused by an immune system problem, an inherited skin problem, virus or a reaction to something that is irritating the skin. Wheal: this dog skin problem is a small swelling on the skin. It can be caused by an insect bite, allergic response to food or drugs (ulticaria). Nodule: A nodule is a small cell mass or knot of cells. It extends deep into several skin layers. 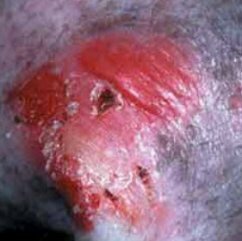 It can be caused by inflamed skin (granuloma), infection (bacterial, fungal), calcium deposit or uncontrolled cell growth (neoplasm). Tumor: a dog skin tumor is a cluster of uncontrolled cell growth. It can indicate the presence of infection (bacterial skin infection or fungal) or be a neoplasm, which is uncontrolled cell growth. Ulcer: an ulcer is a skin lesion that is accompanied by puss. 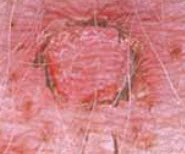 The underlying skin becomes exposed and inflamed. It indicates allergic reaction, injury or a immune system problem. Epidural Collarette: peeling skin that represents a pimple or other skin problem where the middle part of the lesion "peels off". Usually the result of a bacterial infection. Dog skin rash is a symptom of other underlying dog skin disorders. Possible causes include allergy or parasites (fleas, mites, lice). Follow this link for photos of dog skin rashes and information on their diagnosis and treatment. Dog skin lesions is a general term that refers to dog skin disorders that involve accumulation of dead skin tissue. Lesions can be caused by any of the problems described on this page such as injury/trauma, parasites or infection. 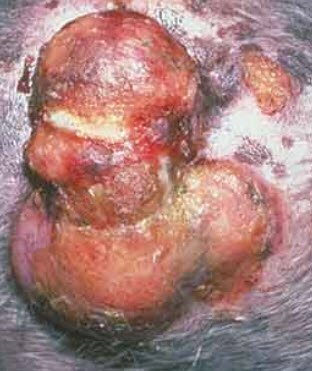 Chronic canine skin lesions are filled with puss and require that they be drained as part of treatment. Bacterial Skin Infection as cause of Dog Skin Disorders: Like most infections, antibiotics are used when a bacterial problem is diagnosed. Bacterial infections are often caused by another condition (secondary infection) such as allergy, an immune mediated skin reaction or a hormonal problem (endocrine issue). There are different types of bacteria that can lead to a bacterial skin infection in dog. Testing will determine the specific type of canine bacterial skin problem to be treated. Antibiotic therapy usually lasts for 3 to 12 weeks depending on the severity of the condition. Canine Fungal Skin Infection as cause of Dog Skin Disorders: A dog fungal skin infection is diagnosed with a device called a "woods lamp" which is used to check skin appearance under the light. Skin scraping tests will confirm any diagnosis that is made. A class of medications called antimycotic agents are prescribed to treat canine fungal skin infection. These include Griseofulvin (administered with meal) and Ketoconazole (tablets). Side effects of treatment can include vomiting, diarrhea and nausea depending on the medication selected. Tests will be conducted 2 and 4 weeks after testing to confirm that all of the dog skin disorders have been properly treated. One reason for itchy dog skin is an allergic reaction. Like allergy shots in humans, this approach has been researched for dogs. In studies, reducing the sensitivity to specific allergens such as pollen was successful 45% to 60% of the time for 1 year or longer. Shots are required for 1 year or longer. Results can be seen between 4 weeks to 12 months with the average dog improving in 4 to 6 months. Even with allergy shots, many dogs will require other supportive therapies for canine allergy skin such as the use of antihistamines. Canine seborrhea refers to a condition where the skin accumulates a protein called keratin which begins to build up and blocks normal functioning of the sebaceous glands, which are located at the base of the hair follicles. This causes the dogs hair to become greasy and the skin to become dry. In addition to changes in skin and coat condition dogs can develop fever and skin infection. There are multiple underlying causes that need to be eliminated, with the specific cause addressed during treatment. Possible causes of canine seborrhea include congenital or inherited (certain breeds are predisposed), allergy, parasites or an endocrine system problem (hormonal). Treatment for seborrhea in dogs involves the elimination of the underlying cause, cleansing lotions and natural remedies that boost immune system strength and skin and coat condition such as Skin and Coat Tonic and Immunity and Liver Support. Antihistamines: In addition to allergy therapy, antihistamines could help a dog suffering from dog skin disorders such as skin itch. Common antihistamines for itchy dog skin include Dexchlorpheniramine, Chlorpheniramine and Cyproheptadine, all three in tablet form. This type of therapy has few side effects with the exception of making a dog feel drowsy. This side effect will have less of an impact as a dog undergoes treatment. Treatment is required 2 to 3 times a day. Another issue is that this approach is only successful in 5% to 30% of the time. That said, if a specific dog responds to treatment, then it is a safe approach to treating itchy dog skin. Fatty Acids: These are know as essential fatty acids are are a common supplement for helping as a convenient home remedy for dog itchy skin and dog skin disorders. Acids such as linoleic (sunflower, safflower, primrose oil) and eicosapentanoic acid (fish oil) all help with skin inflammation. There is a low success rate with this approach, however, for dogs that respond, it could be effective. Do not expect improvement for several weeks. When provided in conjunction with conventional approaches such as steroids, it could help to reduce the dose of the steroid. Glucocorticoids: This approach is a common conventional approach to treating dog itchy skin. There is a high success rate with this approach at a low dose (prednisolone). Treatment lasts for 1 to 2 month with dosages administered every other day. Side effects includes excessive thirst, urination and eating. Another side effect is that it could trigger a urinary infection, skin infection or infection in the lungs. Treatment may only be needed during the seasons where your dog is reacting to a specific allergen. Homeopathic Remedies: There are several herbs that have properties associated with helping dog's with itch. itch is caused by a slight weakening of the protective outer skin layer. Once weakened, the nerve endings become inflamed causing itch. The thought behind homeopathic products such as PetAlive Allergy Itch Ease, is that the skin can benefit from an added level of support. If you suspect a food allergy, the best approach is to try a hypoallergenic test diet where the number of ingredients in a dog's diet is minimized. Do not provide treats or other food during the test period. A diet needs to be tested for 10 weeks to see if there is any improvement. One new diet worth considering is Purina HA Hypoallergenic that makes proteins in the diet non allergenic. This could be a convenient way to see if proteins are the cause of the problem. Usually a sensitive skin dog food contains one simple protein such as fish and a simple carbohydrate such as potatoes, with no artificial ingredients, flavors or coloring. There are several types of parasites that can cause dog skin disorders such as dog flea dermatitis, canine scabies, canine lice and dog chiggers. The following table lists the active ingredient and typical products, when available over the counter, for each condition. Frontline Plus (mixed with methoprene to provide protection against all flea life stages - frontline alone does not prevent the development of flea eggs and larvae. Fleas in Dogs: There are many types of products to help with fleas in dogs. Treatment usually lasts from 4 to 6 weeks. If a dog is sensitive to a flea bite (flea-bite hypersensitivity) then usually a insect growth regulator (interrupts the flea lifecycle) and a product that kills fleas (adulticide) are recommended. Common ingredients for IGR's are Fenoxycarb, Lufenuron and Methoprene/Pyriproxifen, and for Adulticides are Fipronil, Imidacloprid, Nitenpyram, pyrethrin, permethrin and selamectin. Products come in a spot-on topical or spray form. Specifically, consider a monthly prevention product for dog skin disorders such as Program, Sentinal or Frontline Plus. Dog Mange and Canine Scabies: Sarcoptic and demodectic (demodex) mange is caused by mites that burrow into a dog's skin causing itch. Dog's that scratch could cause a secondary infection. Mange can spread throughout a dog's skin. A safe effective option for treating mange is a lime sulfur dip such as Naturasil. It mixes with a dog's shampoo to help with familiarity for the dog being treated. Amitraz and Paramite dips are only available with prescription for demodex. For Cheyletiellosis mites (rabbit mites), the prescription Ivermectin is used or the over the counter lime sulfur products. Symptoms of mange include bald spots anywhere on the body including the face, neck, legs, eyes and head. Dog's may avoid eating or have reduced energy levels. With treatment, mange treatments will need to continue for 1 to 6 months. Over the counter lime sulfur dips are just as effective as prescription products with fewer side effects. Canine Dry Skin: Dry dog skin has many causes including nutrition issues, bathing and grooming (particularly in long hair dogs), infection and parasites. If environmental factors are thought to the be the cause, then treatment usually starts with a cleansing shampoo that has the sudsing and cleaning action to deep clean a dogs coat and skin. Medicated canine shampoos as indicated above can be of help in specific instances. Other topicals are available from a veterinarian. Homeopathic remedies such as PetAlive Skin and Coat Tonic for Healthy Skin and a Glossy Coat and a multi-vitamin made for dogs may also help provide added skin support. Have A Question About a Dog Skin Problem For Our Editors or Helpful Story to Share? Do you have a question for our editors or a helpful story about this? Share it! Please include the age of your dog, breed, the area of the body, your dog's general health and any changes in diet, appetite, behavior, skin and coat. Let us know about any treatment that is currently under way including the names of medications or any other information that could help our editors provide an answer. If possible, please submit a picture of the skin condition below. Do you have a picture of your dog's skin condition to add? It will greatly help in answering your question. Click the button and find it on your computer. Then select it.